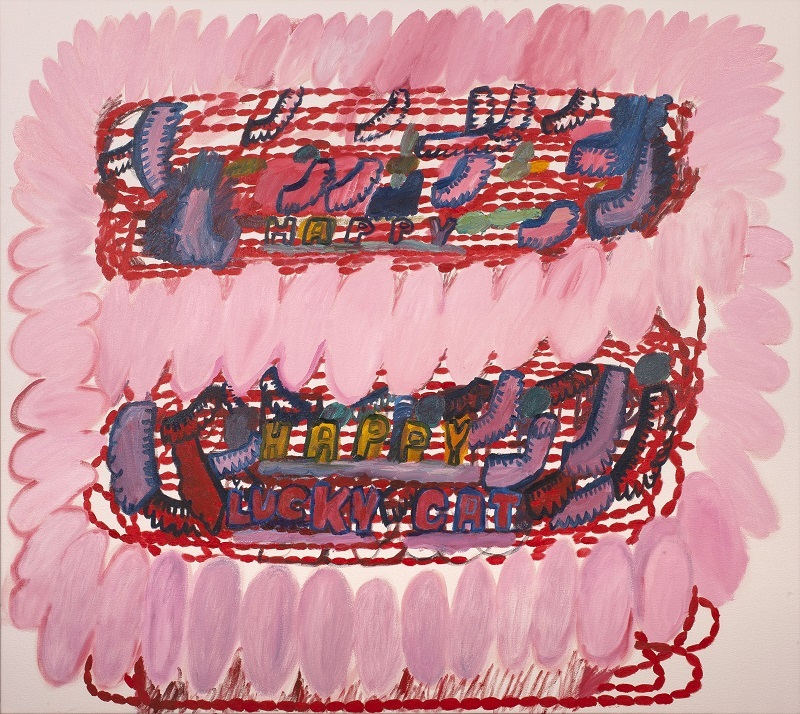 Intersticism Project and Lucky Cat, the current exhibition at the Linda Matney Gallery, is the product of the imagination of artist Martha Jones. This exhibition features a wide variety of artwork including sculptures, paintings, and drawings. Below is an interview with Martha in which we discuss her current exhibition. First of all, what do you mean by the term Intersticism? Intersticism is a word I made up as I played a sort of word game with myself during long painting sessions when I had time for part of my brain to think about what I was actually doing on the canvas and another part of my mind could meditate on the sort of theory of what I was doing. I was looking for a word to describe the most integral characteristics and challenges of the series of paintings I started working on last Spring. The word is made up from the word interstice that means gap or space between things (usually a very small one)—and –ism. I’d been reading John Richardson’s multi-volume biography of Picasso and I’d decided that it would be great fun to have an ism of my own—or to create an art movement as it were—so intersticism is then a somewhat tongue-in-check endeavor. I need to explain why small gaps or interstices are important in my work. I like to paint on grids and I’ll frequently begin the painting process by laying down a grid that I go on to embellish. This year I developed a new sort of grid that in its most basic form looks like a series of oval or bead-like shapes strung together into lines; these are laid out in a pattern of ovals that to my mind resembles a whirlpool or a spiral from the top of the painting to the bottom. When the bead-like bits come right up to each other, very small diamond-shaped gaps can appear. I usually painted these bead-like lines in red and when they appeared against the canvas that had not yet been painted, the resulting diamond shapes often popped out obtrusively. One of my overall goals for constructing an effective composition is to come up with a composition that will keep the eye of the viewer moving around the entire painting and resting only on felicitous passages; at the same time I am satisfied that a painting is complete when its overall composition and the smallest of details can coexist compatibly. To my eye, many of these tiny gaps between the beaded lines stopped the movement of the eye and needed to be addressed in a meaningful way; doing so marks a stage in the painting process that leads into the final integrative stages of the process. How do you describe the kind of abstract painting that you do? Can you describe your work process when painting? Can you describe what led you to start painting abstractly or what appeals to you about it? These are huge and complicated questions. In all abstract painting images can appear, like a cloud in the sky, to resemble one thing to one person and something different to another person. By extension, and perhaps more interestingly, abstract images may appear to represent more than one thing to the same person. Or in other words they can have the capacity to change. It is the metamorphic properties of abstract imagery—or their capacity to be transformed into different forms—that interests me most. Abstract paintings are primarily but not exclusively self-referential (I mean that basically they are really about themselves), and the process becomes about finding the best solution to the visual and esthetic challenges the work poses (rather than representing well an external subject as in representational painting). Even when I was working in more representational styles, I did abstract or simplify forms, flatten them out or make them resemble patterns, but the presence of the external object was always apparent. When I started working in purer abstraction, I came to it by the same sort of process that has been documented for Kandisky and Mondrian, by simplifying a representational composition to the point where the external object is no longer apparent. After I’d done this a bit I just would start the process without going back to the external object at all. I started painting in pure abstraction in 2006, and the visual images that I used for a long time were themselves visual symbols or images that had already been abstracted: letters of the alphabet for one. I was living in Greece at the time (from 2006-8); a lot of things that were happening with me at the time as well as my education in Greek and Roman literature, history and art were very important for shaping my visual vocabulary. The major symbolic abstract forms I played around with were some of the most basic and abstract forms in ancient Greek and Roman art, periods known primarily for the development of a representational artistic style. The 2 motifs I used the most up until this year were the meander pattern and a repeated arch-like pattern based on a Roman arch. Abstract painting can have lots of different looks about it. The kind of abstract art I’m trying to produce will, I hope, show the presence of both volume and line and a significant interplay between them. I’d like my volumes to show some real weight but to appear to be suspended in space. I like to see both thick and thin paint application in the same painting and also to see refined and seemingly rough or unfinished bits of painting juxtaposed. I like to create a play between forms that appear to be in the background from one point of view but in the foreground from another. Most of all, to answer the question about process, I think a painting will be finished when details contribute to the overall composition and the overall composition has a sense of volume and weight that appeals to me. I have a preference for overall compositions that appear to be round and plump. My paintings can vary a lot in how long they take to complete and how thickly they turn out to be painted. I may arrive at a satisfying solution quickly or after a very long difficult process. I’ve got to say honestly that in the last year I’ve found with almost every painting I’ve done that the painting has turned out only to be really good if there was a point in the process where it looked like the whole project ran the risk of failing. Why did you decide to start making sculpture, and how do you see your sculpture developing in the future? Can you describe how your work in sculpture relates to you paintings? I have been making the sorts of sculptural assemblages that are in my present exhibit for about 2 years now. I see these sculptures as an experiment and a real departure from my normal work. Experiment is involved in my successfully completing each painting I do, but almost everything about the sculptures I’m doing now is fundamentally new and experimental for me. The sculptural assemblages remind me of theatrical maquettes, miniature stage sets: small, humorous, evocative and ironic scenes of frozen and silent action. I can treat many of the same themes I’m interested in in my paintings but in a more conceptual manner. The use of found objects and small ceramic objects I make at a commercial ceramic studio provides a sort of distance to the work in a way that I don’t have in the ambitious paintings that involve my own intimate labor. I’ve been very pleased with the results although I see these sculptures as very much the products of a painter who also sculpts rather than of an artist who really focuses on sculpture primarily. I do work in other artistic media also, drawing, films sometimes, poetry writing, a little piano playing, and I feel that the sculpture, like these other pursuits, enables me to step to the side when I can’t or don’t want to work in the studio on the messy process of oil painting and to bring something new back. For instance, one influence the sculpture has had on the painting is that I have done at least one painting recently that is more figurative than usual and that, like several of the sculptures, plays around with animal forms. I have some plans for working on more traditional sculpting skills in the near future. I’m thinking of doing some bronze casting; I’m thinking of casting some found objects in bronze but am planning also of fabricating some work in plaster or other similar medium. What are your artistic influences? Especially for the paintings (but if you have anything to say about the other work also). Mostly Philip Guston. Mostly Guston of his last period. Guston had a lot to do with my color schemes, and I love the humorous look of much of the work of his last period—quite a disjunction with his sad themes, but nevertheless. 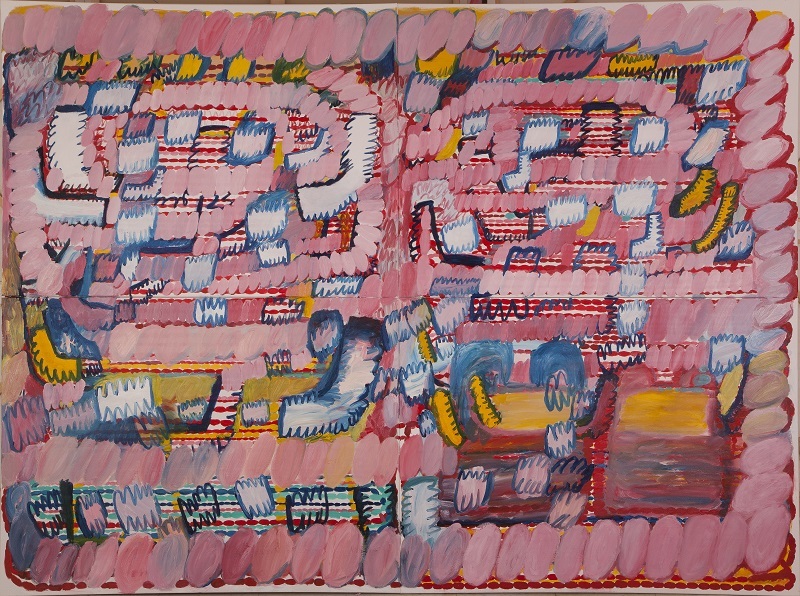 My painting technique has tended to be more abstract than his of this period but more like his work in this period than when he was a pure abstractionist. They are not as well known, but I really like the paintings he did in Rome during this last period. Like Guston I like painters of the Italian Renaissance; my favorite is Giotto, for the blue and pink color scheme (for heaven and earth), for his red line and the sense of volume to his figures. I like Twombly and did the one painting the day he died, but I don’t think my style is much like his. I’m interested in Mediterranean themes and the influence of the Greek and Roman classics like he was, and my color schemes are a lot like some of his. 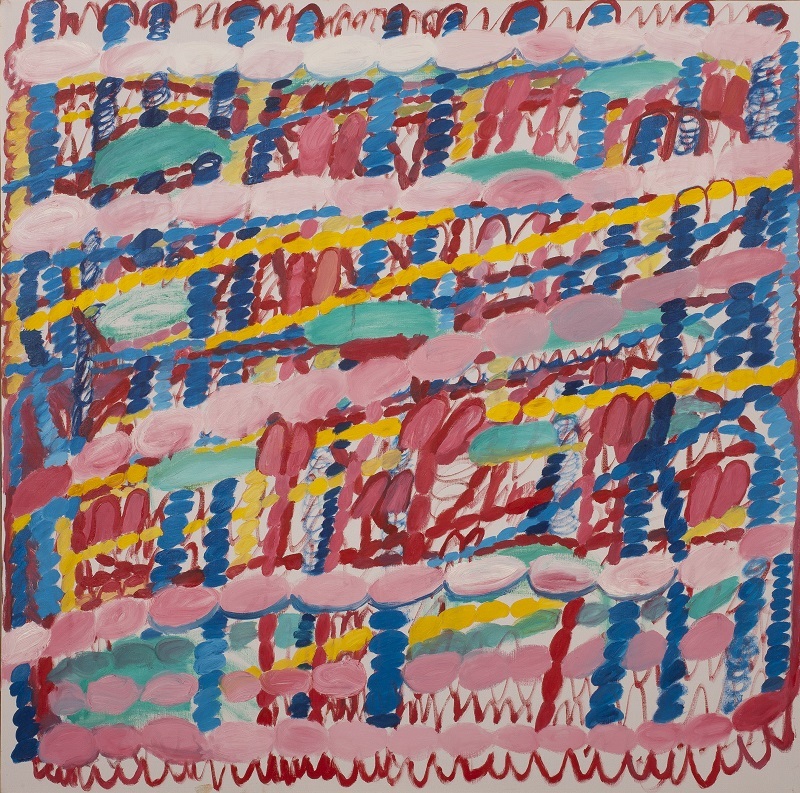 I like younger painters like Chris Johanson; I like Carroll Dunham. I like Claude Lorraine. Underlying it all is my interest in Greek and Roman art. As a student I really studied Greek and Roman literature and language more than I did art and archaeology, but you can’t escape it. I have spent a lot of time over many years now drawing art and artifacts in museums; I started out focusing on Greek art but draw all sorts of things I like now. At one time I was very interested in African art, drew many artifacts in museum collections and used that imagery in a lot of paintings about 10-15 years ago. I like to draw in museums to keep my hand in, and my more formal drawings are pretty much based on these sketches. For sculpture: Of course there’s Nam June Paik; anybody who does something with television bodies has to mention Nam June Paik. When did you start painting in such a large format, and what appeals to you about it? Why do you use multiple canvases attached to each other? I started painting large with 4 canvases bolted into one in 2007/8. It was purely out of the curiosity and ambition to work on such a large scale. I am very interested in working in various scales and in seeing what’s involved in going back and forth between quite small, medium-sized work and more monumental-sized paintings. Although they aren’t represented in this show I started working in oils on the size of a small drawing on paper (about 9” x 11” and thereabout) about 3 years ago; haven’t done too many of these this year but I’d like to do some soon. I started using canvases bolted together for practical reasons: the individual canvases were easily transportable from the art supply store. I stretch a lot of my own canvases but have never stretched something this large. In theory I planned to disassemble the canvases if need be for transporting or storage but have never ended up doing so. I don’t think I would now; frequently I paint in the space where the canvases meet and I’m afraid I’d damage the paint job if I were to break a seal there now. The more I think about it, the clearer it is that a lot of things that characterize my painting originated in the 2-year period I spent in Greece from 2006-8: large scale work, the colorful palette, abstract compositions. Can you comment on the role in your painting of elements such as the colorful palette, humor or the use of written text? I mentioned that Guston and Giotto among other artists influenced my use of the colorful color schemes I use, and I also said something about having started with these schemes while I was living in Greece. Experiencing the light in Greece also had a lot to do with a shift from darker colors to brighter colors at that time. There’s really nothing like the light in Greece; it seems to just open the eye very wide so it can pour in. A lot of people think my color schemes are cheerful; they certainly are upbeat, but I also think there are darker undertones that give the paintings greater weight and more seriousness. I’m happy to paint paintings that can be experienced as serious efforts and works that make serious statements, but I also want them to have a comic effect. The predominance of pink, I believe, contributes to this. I think of pink as visually harmonizing, but I also appreciate its humorous associations. I’m also interested in the playful association of ideas and incongruous elements. I mentioned that I write poetry and that I’ve used letterforms for their abstract symbolic value in my paintings; I’m interested in using language (including poetry) as formal elements in the work. I’d like to get back to the title of the show and ask if you can say something about the Lucky Cat theme in your work? I feel that the Lucky Cat theme really gets to the humor I want my work to convey. In the most recent phase of the Intersticism Project paintings, I’ve been working with images of Japanese Maneki Neko figures. These are the cute little cat figures you see in the windows of Chinese restaurants or almost everywhere if you go to any Chinatown business district; often they have mechanized waving arms. One of the names that are used for these figures when they are mass-produced and sold in this country is Lucky Cats. I started out putting just the upraised arm into the paintings but then started working with abstracted versions of the whole cats. The last thing I finished before this show went up was the sculpture covered with battery-powered cat figures. All works by Martha Jones are available for purchase.